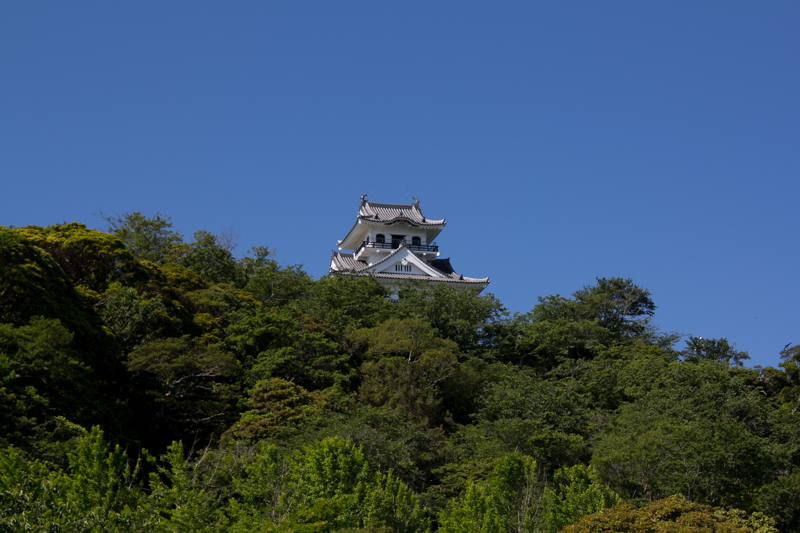 Tateyama castle (館山城) is located on the Shiroyama mountain, one of about 70 meter height from hillside in the south part of Tateyama city. 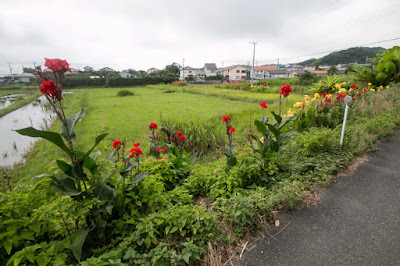 Tateyama area is a 3 kilometer square shaped flat area faces Tokyo bay at the tip of the Boso peninsula, and one of two large size flat land in Awa province (south half of Boso peninsula) along with Kamogawa area at Pacific ocean side. In addition to large flat land, Tateyama area had a good port with islands suitable to anchor ships. Based on the primitive navigation skill it was difficult to pass the Pacific coast of Boso peninsula toward north, thus Tateyama port worked as a end of long sailing route from Kansai area and transit point to inner gulf transportation of Tokyo bay. 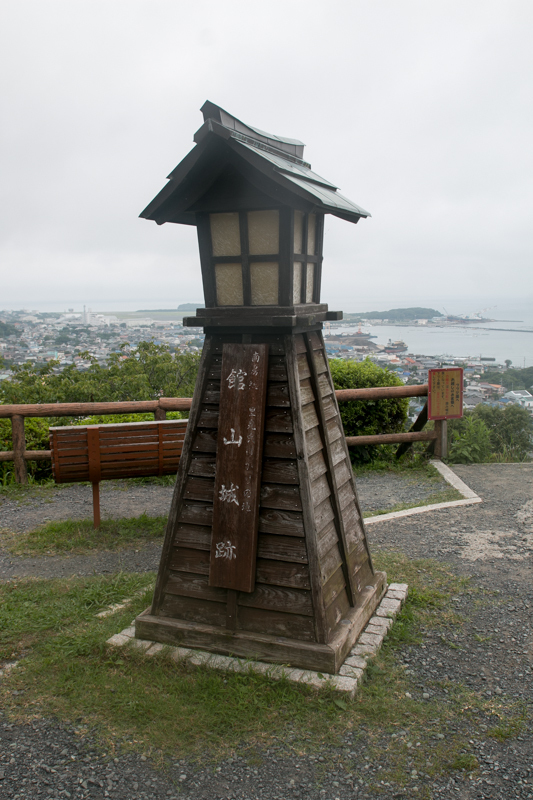 In addition to this, as an end of Miura straight, Tateyama area is an important point to defend Tokyo bay and Tokyo city, thus there is a base of Japanese Maritime Defense Force at Tateyama city. Tateyama castle was built by Yoshiyori Satomi (1543-1587), leader of Satomi clan at that time, as his residence in 1591. Satomi clan was a traditional clan which was a branch house of Nitta clan, a major house of Minamoto family and rival of Ashikaga clan, which established Muromachi Shogunate. 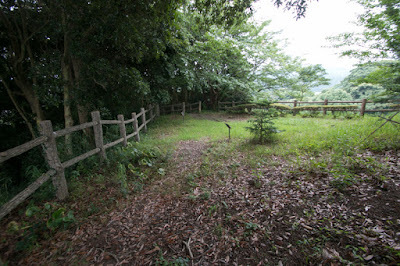 Satomi clan landed Awa province in the latter half of 15th century united whole Awa province by the beginning of 16th century. Satomi clan united Awa province once confused at internal conflict, but overcame it and next aimed at Kazusa province at the north of Awa province. 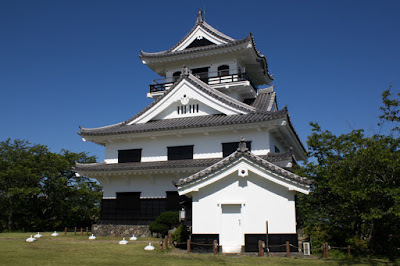 At that time major part of Kazusa province was held by local lord Mariyatsu clan at Mariyatsu castle, but because of the defeat at the first battle of Konodai and succeeding internal conflicts, Mariyatsu clan significantly lost their power. Looking at this situation, Satomi clan intruded into Kazusa province and ruined Mariyatsu clan, thus seized Kazusa province. 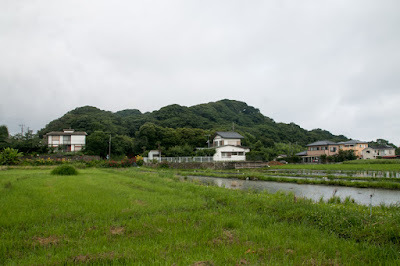 But this was the start of long continuous battle against Hojo clan, the warlord of Sagami province (Kanagawa prefecture) already seized central part of Kanto region. 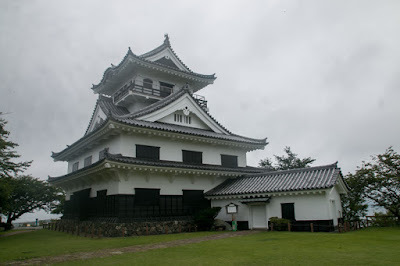 Hojo clan had far larger territory and many soldiers than Satomi clan, but in spite of several defeats, Yoshitaka Satomi (1507-1574) made even match to Hojo clan in cooperation with external power such as Kenshin Uesugi (1530-1578), the warlord of Echigo province (Niigata prefecture) and a fatal rival of Uesugi clan. 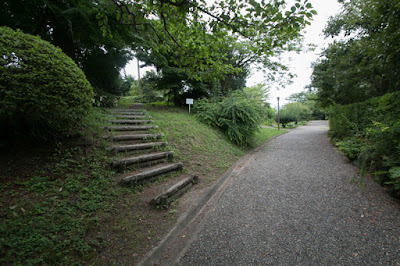 However, after the death of Yoshitaka, Satomi clan became inferior before growing Hojo clan. 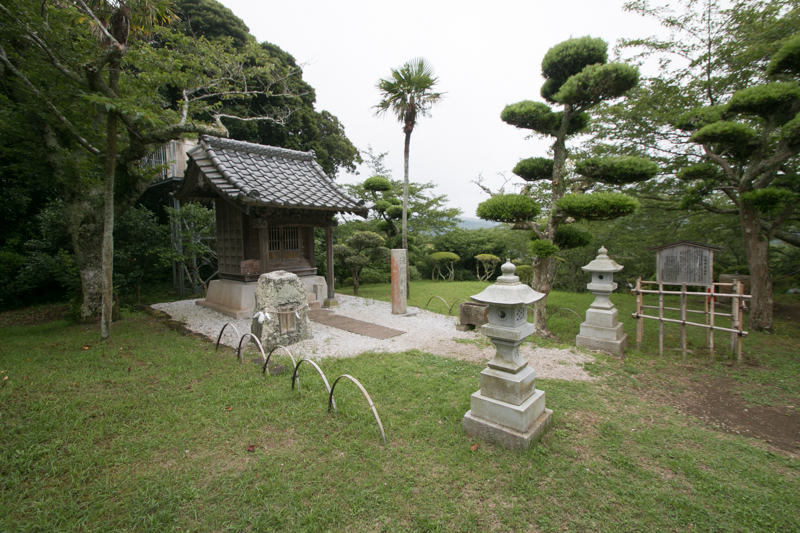 Finally in 1574, Satomi clan made peace with Hojo clan. 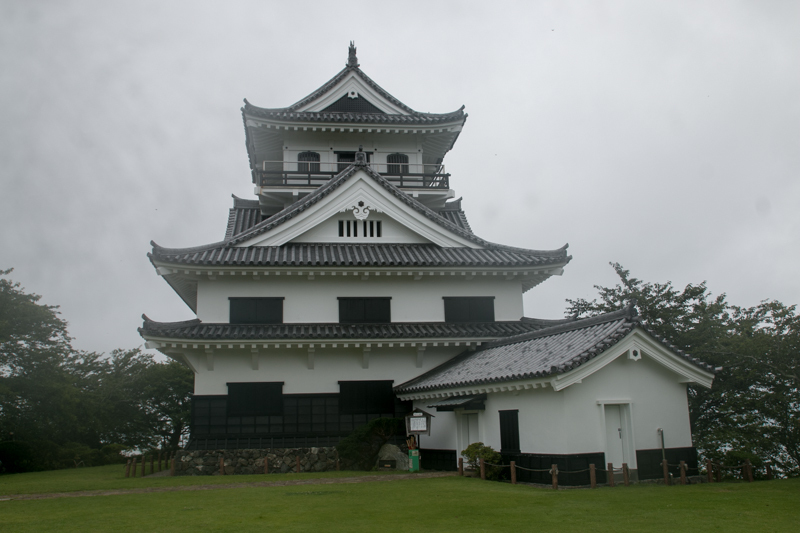 But this was substantially a subordination of Satomi clan to Hojo clan, and Satomi clan lost north half of Kazusa province. 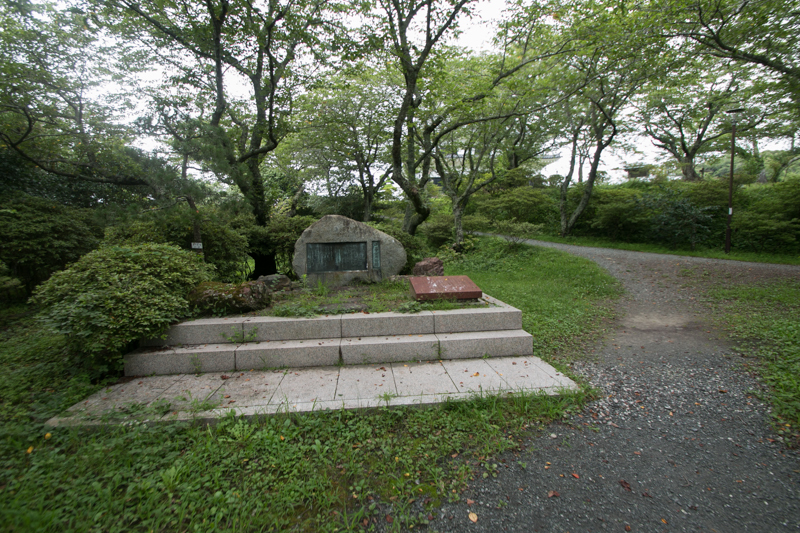 Yoshiyori Satomi (1543-1587), the grandson of Yoshitaka, retreated from Kururi castle to Okamoto castle at the north of Tateyama area, and focused on the improvement of economy. 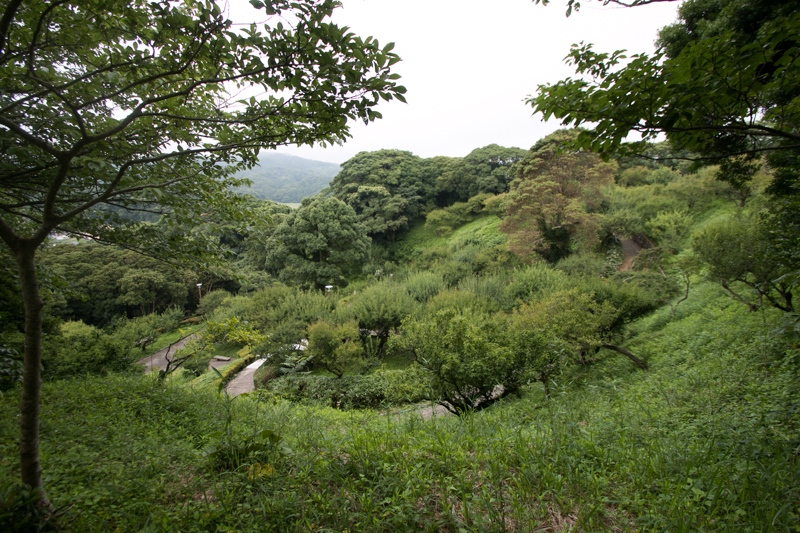 In the meantime, Hideyoshi Toyotomi (1537-1598) became the ruler of central area and expanded his influence to Kanto region. Satomi clan connected with Hideyoshi, but Hojo clan did not subordinate to central authority. 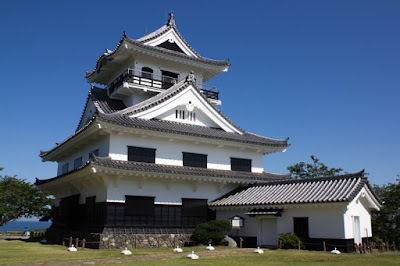 Finally in 1590, Hideyoshi lead overwhelming army and marched to Kanto region to ruin Hojo clan, and finally Hojo clan opened their main base Odawara castle. Hojo clan which was the fatal enemy of Satomi clan was ruined, but at this time Kazusa province was confiscated and given to Ieyasu Tokugawa (1543-1616) who became the lord of whole Kanto region. 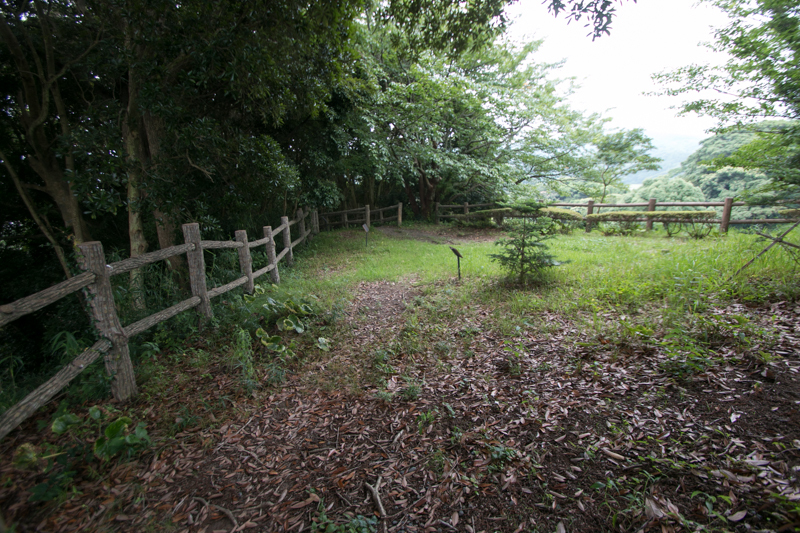 Anyway Satomi clan once could survive as a feudal lord under Toyotomi government. In 1591, Yoshiyasu Satomi (1573-1603), son of Yoshiyori, built Tateyama castle and moved his main base from Okamoto castle. 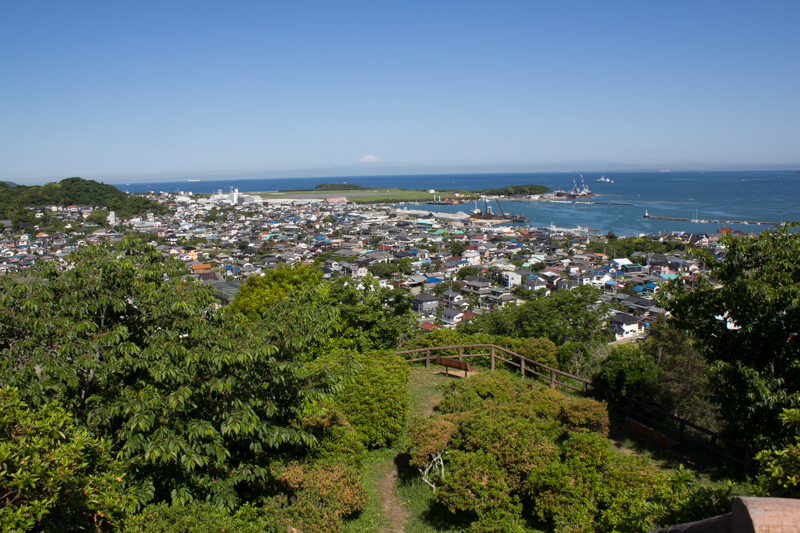 Yoshiyasu already started to develop Tateyama town and port as a center of commerce, in cooperation with agricultural production at plain area. 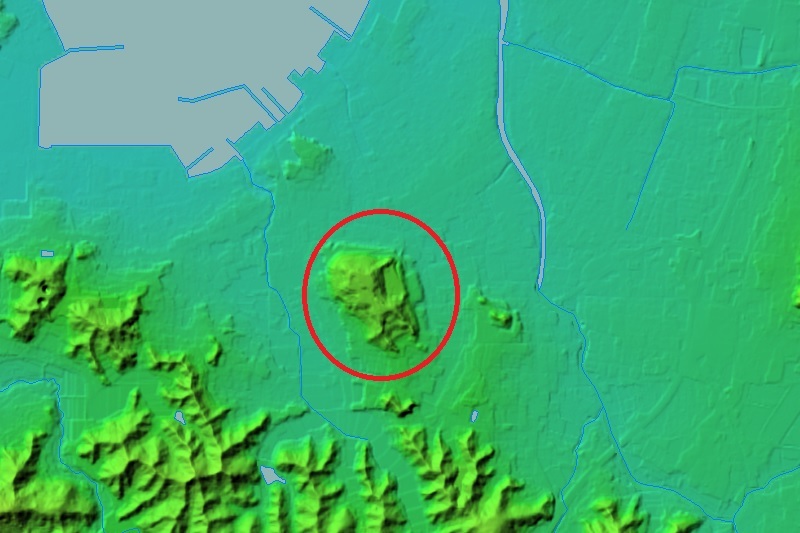 Now castle site is totally inland but originally an inlet reached next of castle, and it was possible directly control the port from castle. 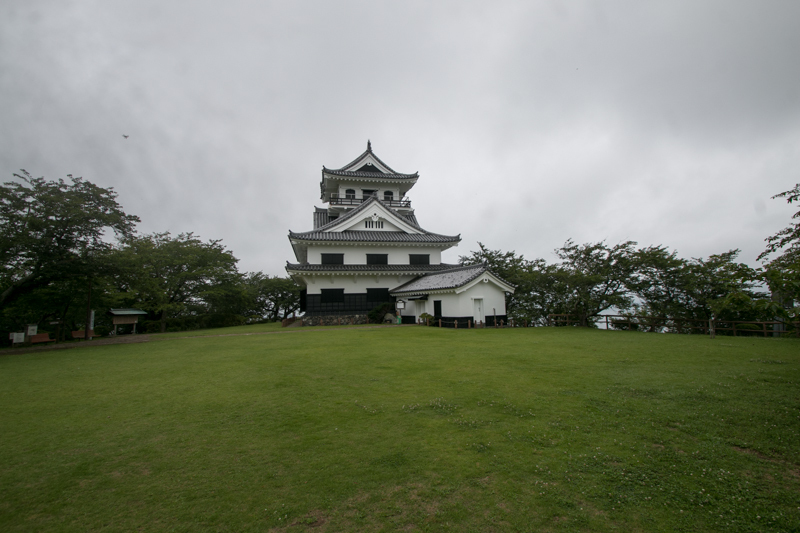 New Tateyama castle on the corn shaped mountain behind Tateyama port might be a symbol of new era of Satomi clan overcame turbulent period. 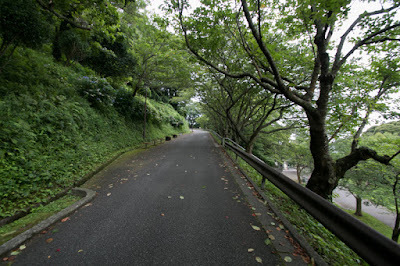 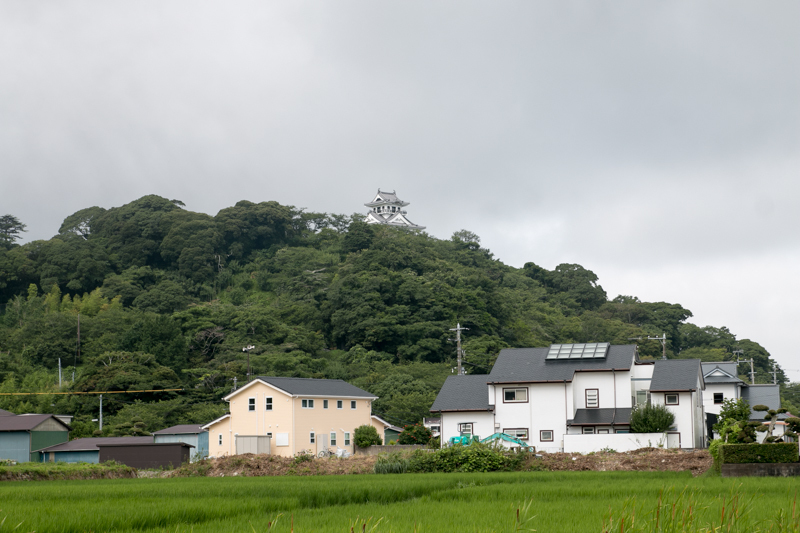 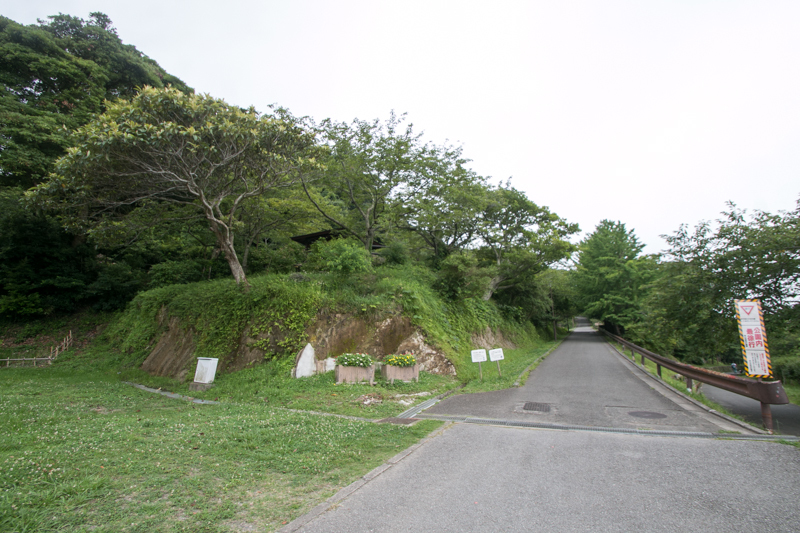 Shiroyama mountain is a oblong shaped hill of 400 meter long and 200 meter wide. Considering its shape the peak of the mountain might be at the north half and there might exist central area, but the top of the mountain shaved to flat to place anti-aircraft guns during World War 2. Now there is a large flat space where main tower like building, but this is totally different from original shape of the castle. 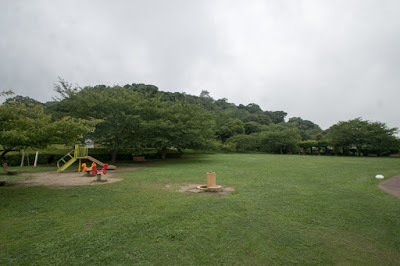 But south half of the mountain might keep original shape. 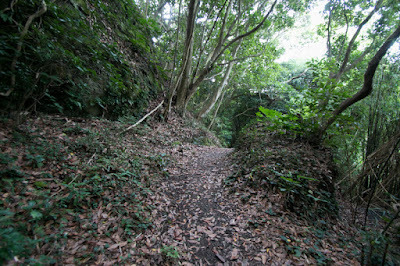 Between two ridges terraces are built, and at southeastern ridge there is a narrow road to climb to the castle, protected by clay gates. 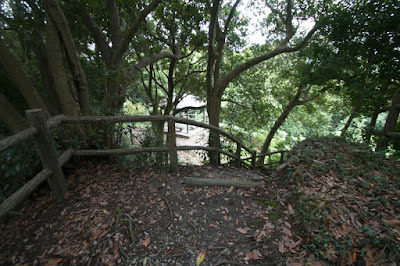 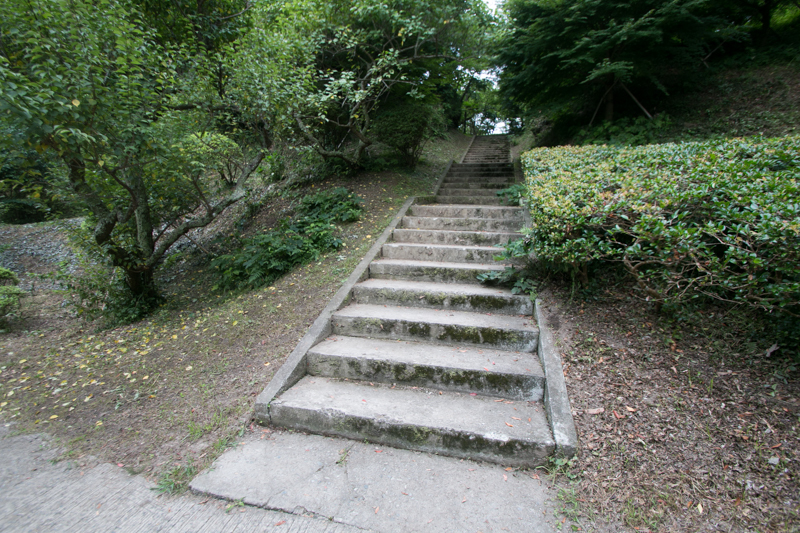 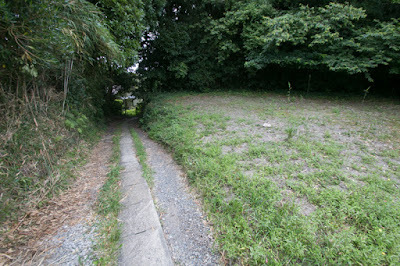 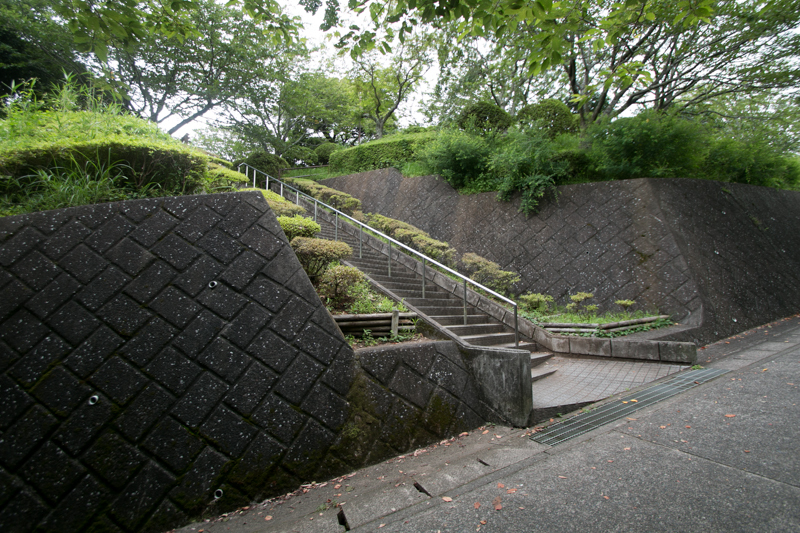 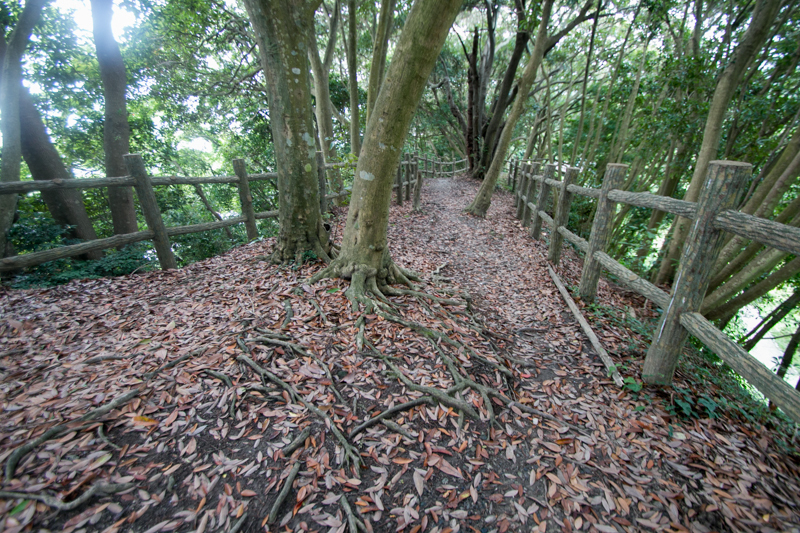 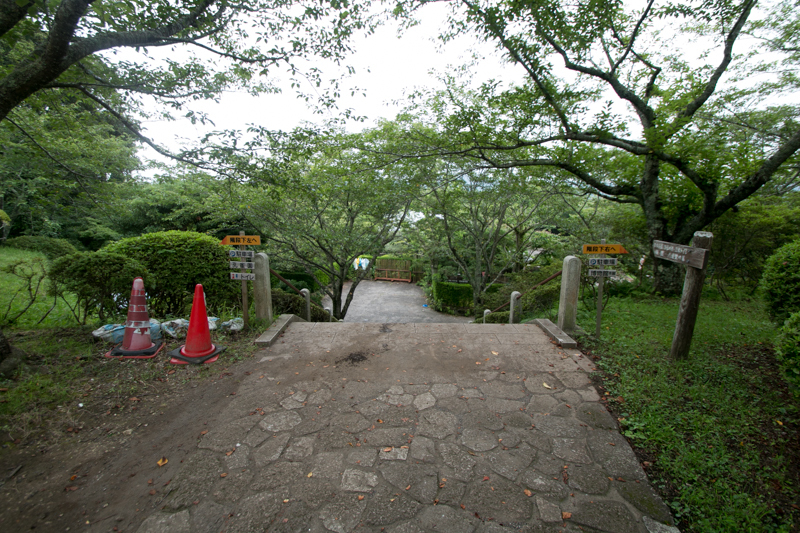 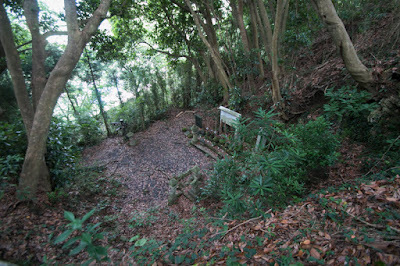 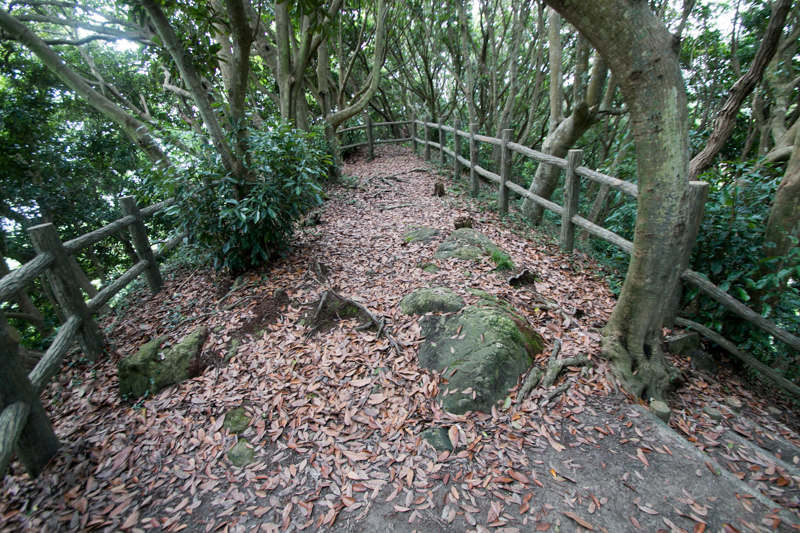 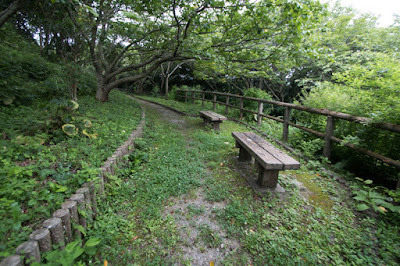 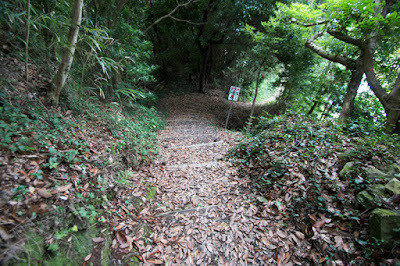 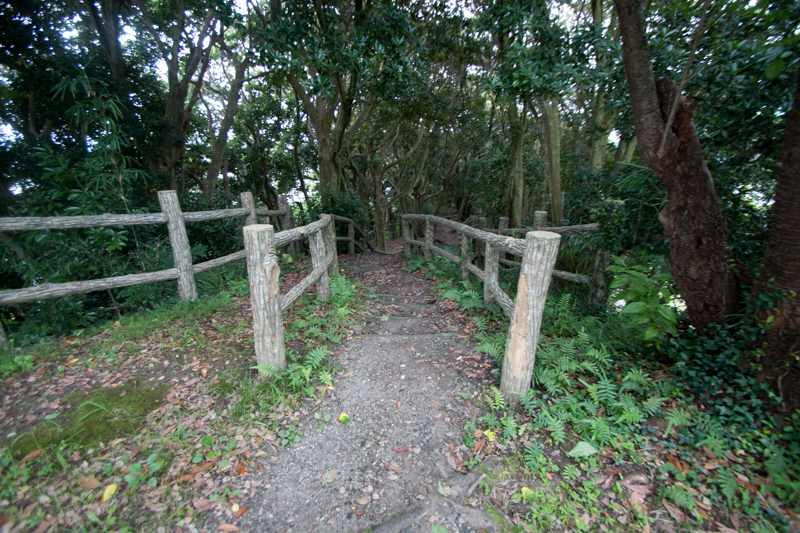 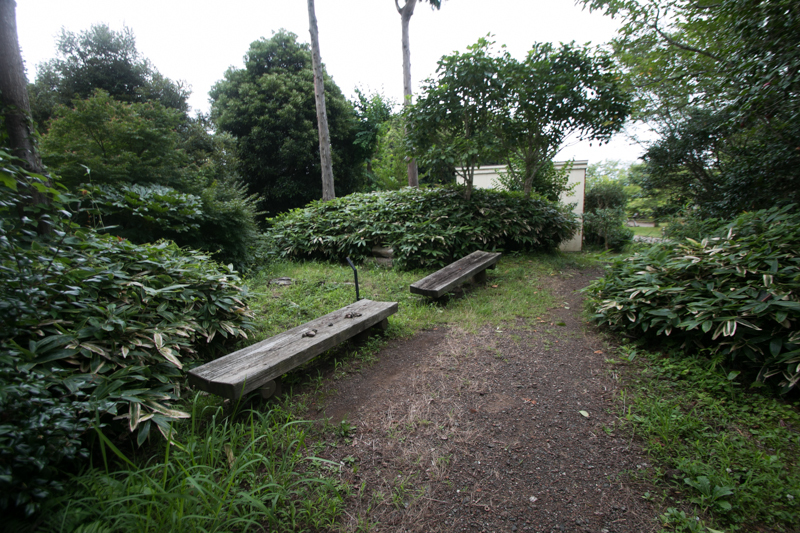 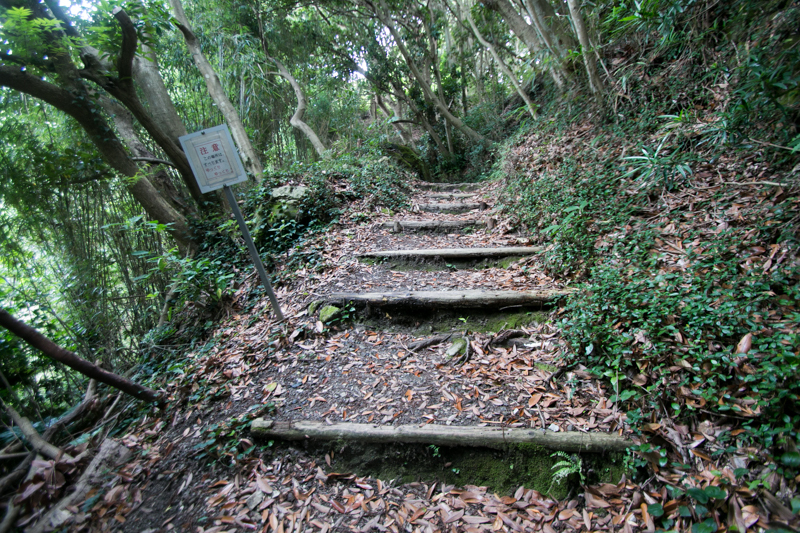 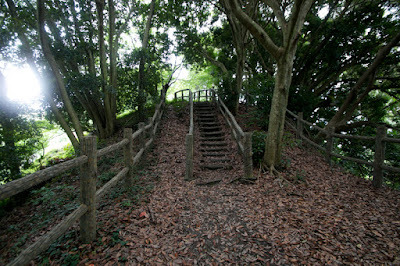 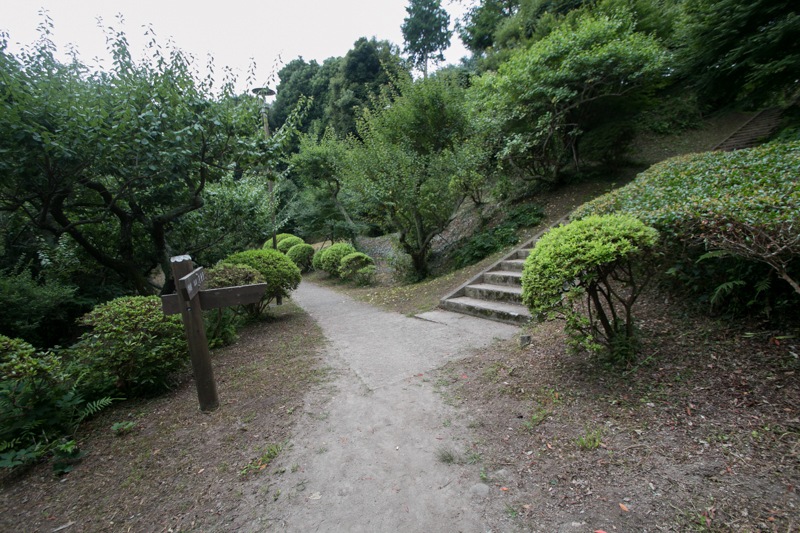 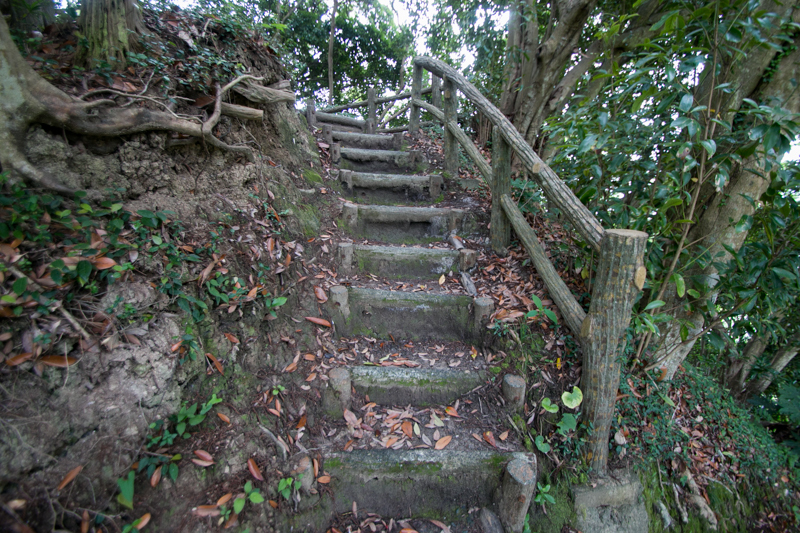 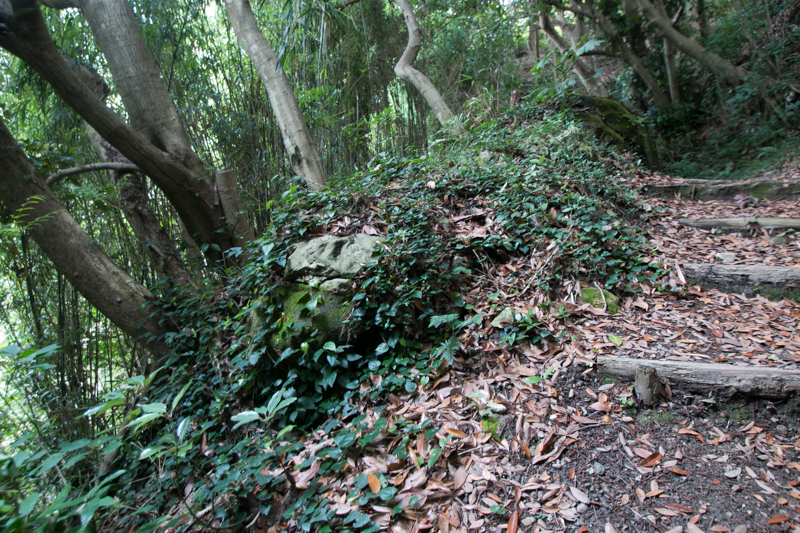 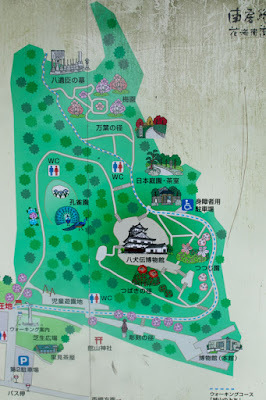 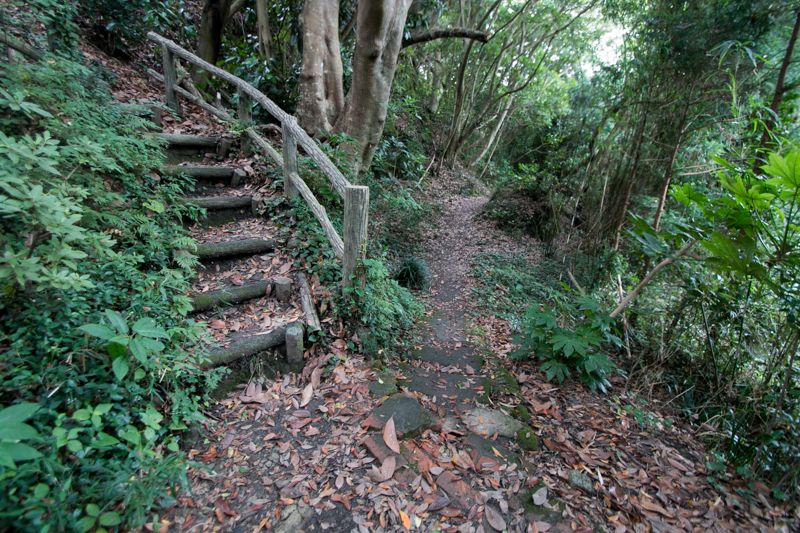 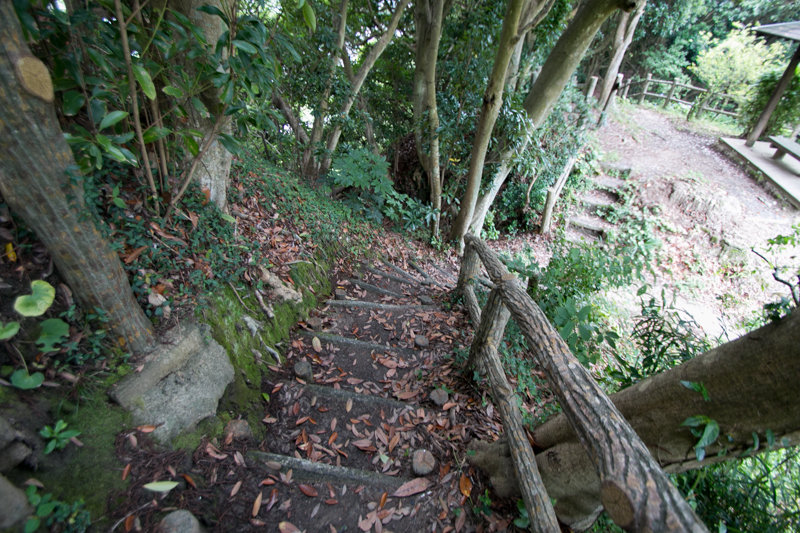 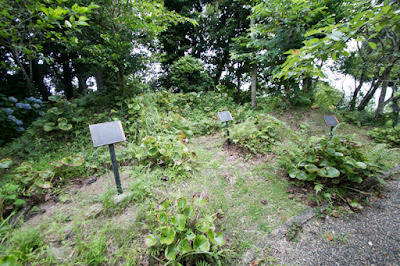 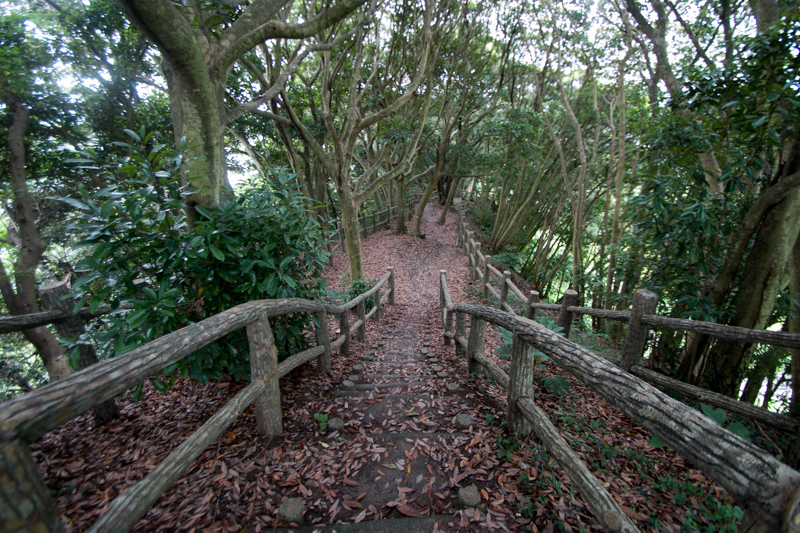 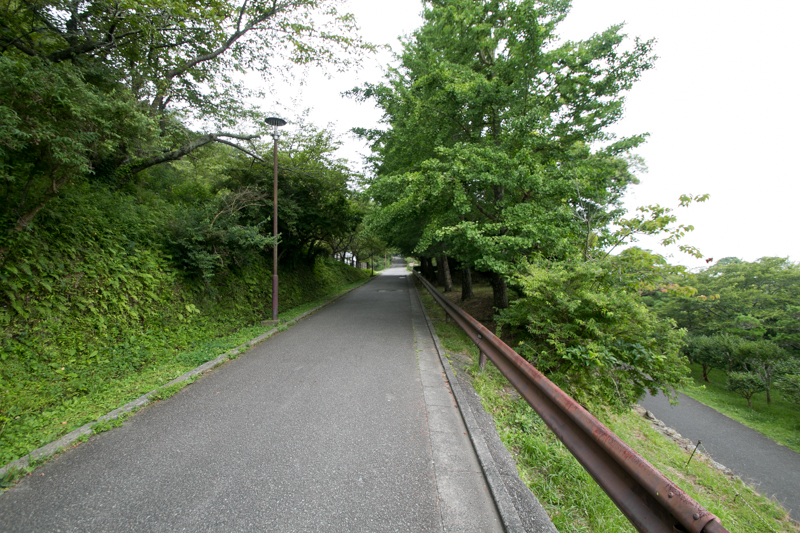 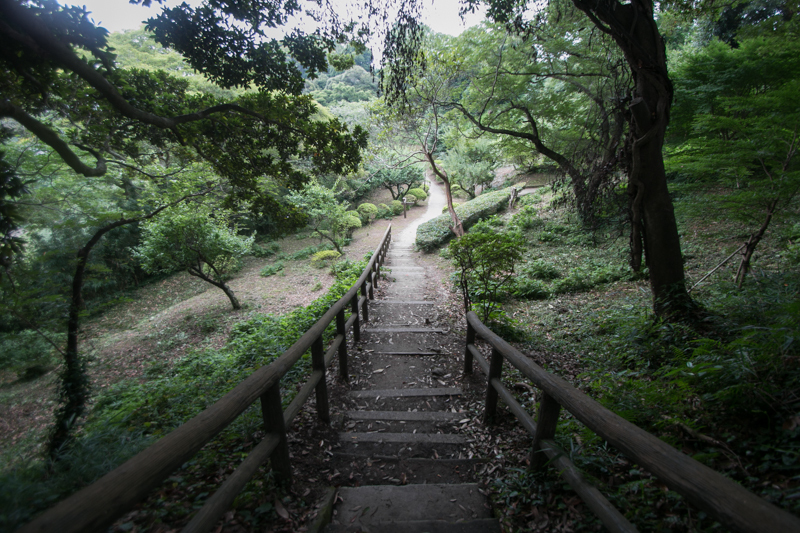 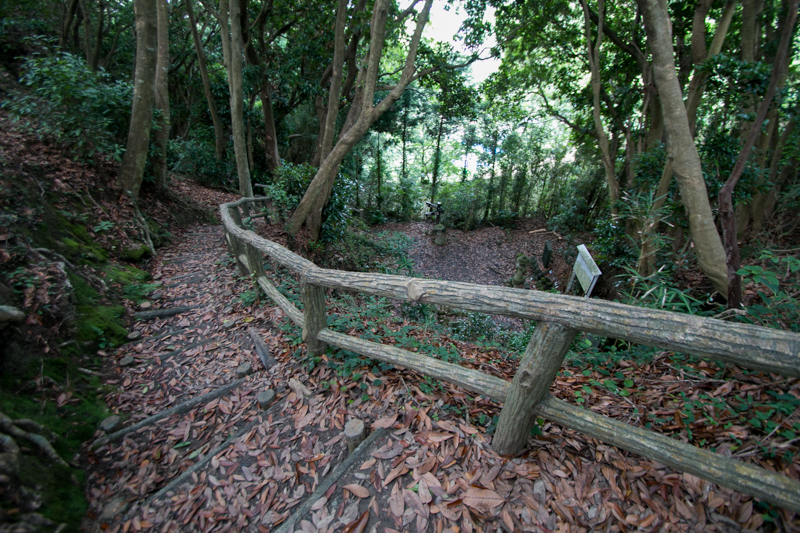 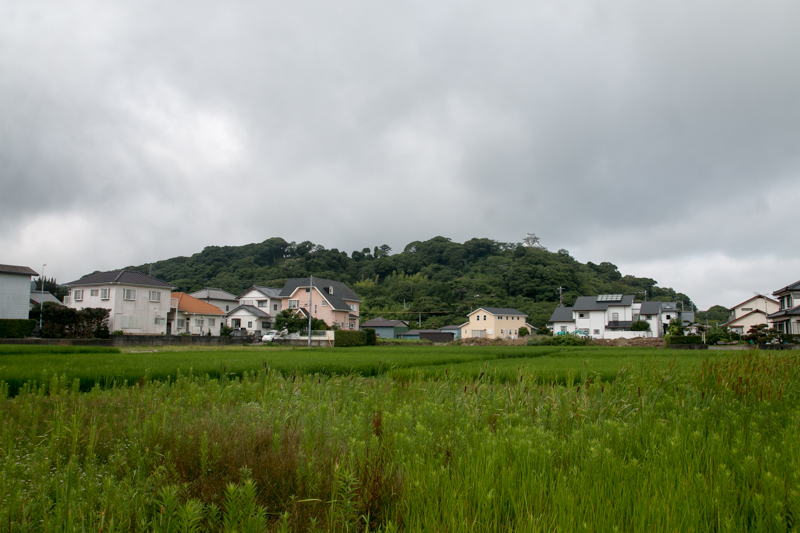 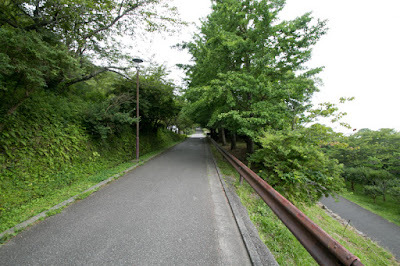 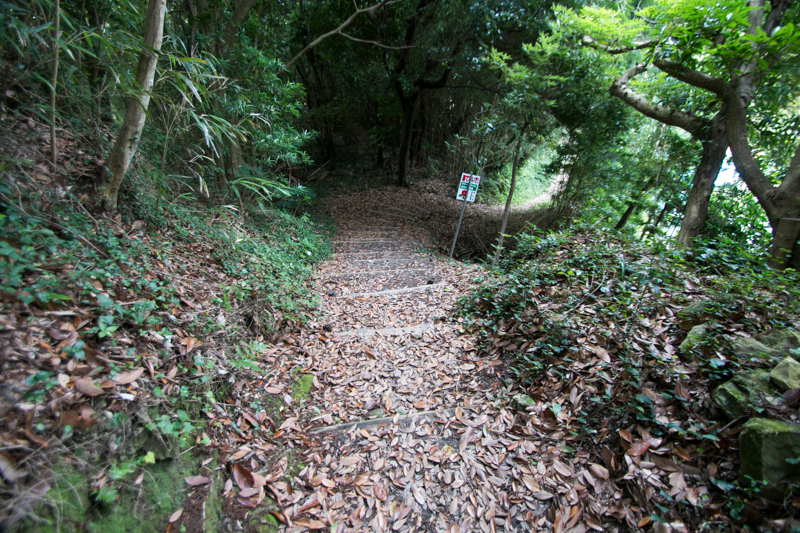 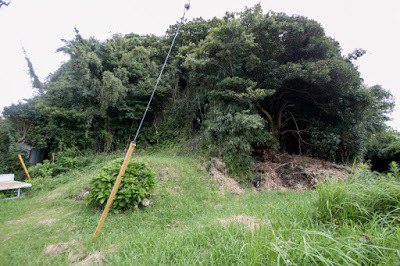 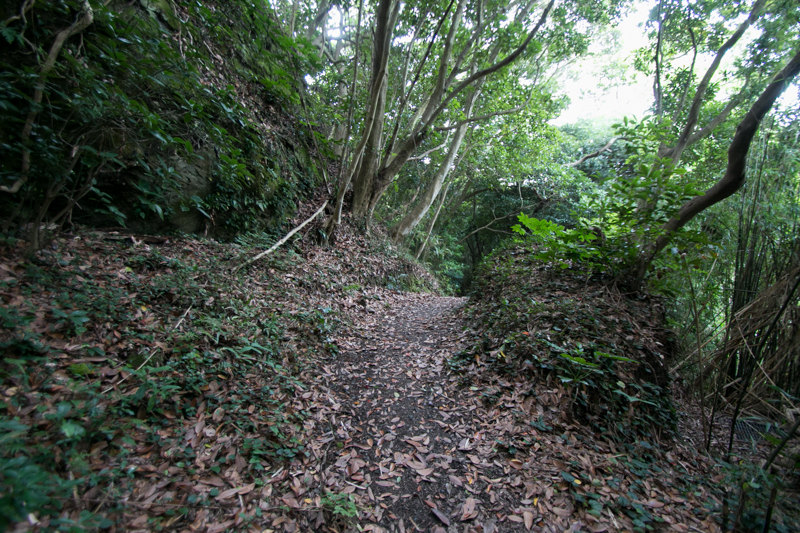 Ahead of this route there is a small height where administrative office was built after the abolish of castle, and there might be the residence of Satomi clan. 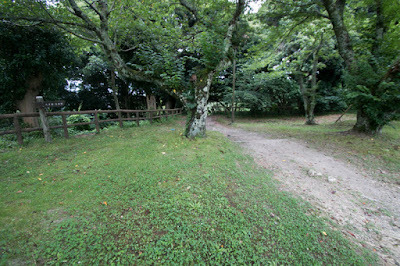 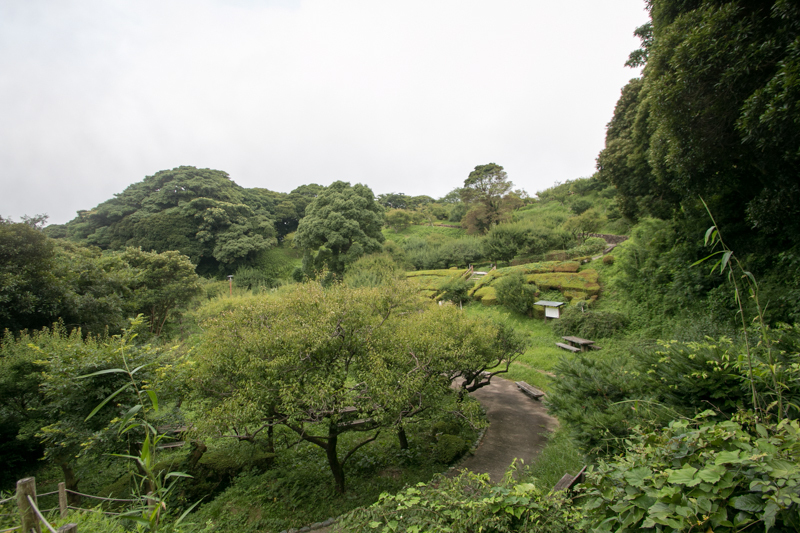 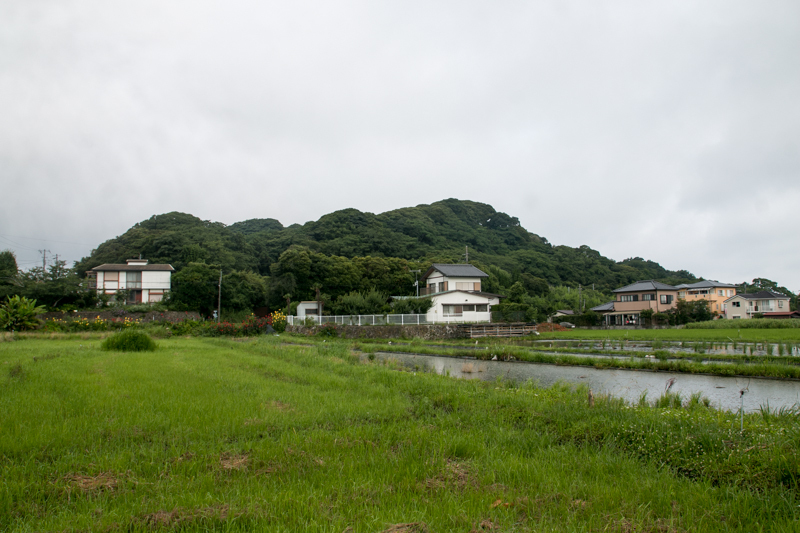 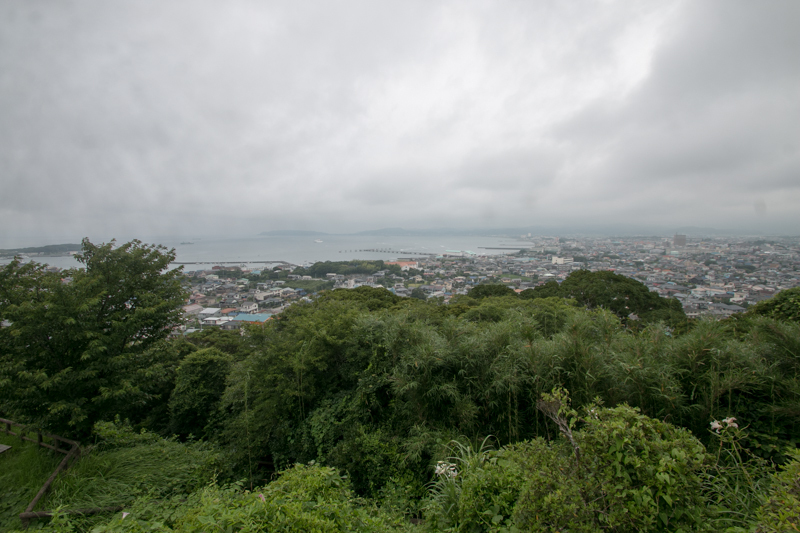 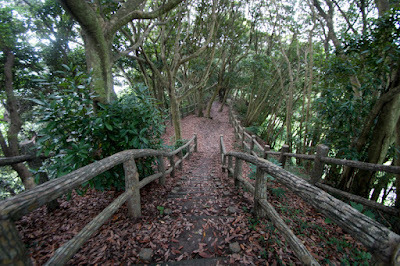 Originally a large water moat surrounded Shiroyama mountain and flat area at the south of the mountain. 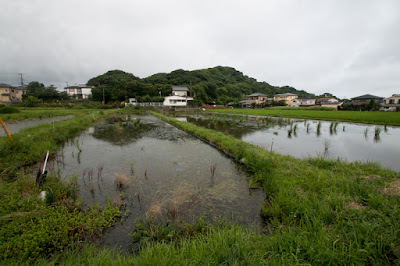 This water moat totally disappeared but partially remained as a low ground of rice field. 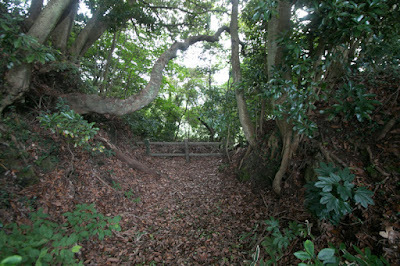 Additionally, another small peak at the east of the castle might be used as a front fort, and ruin of dry moat still exists. 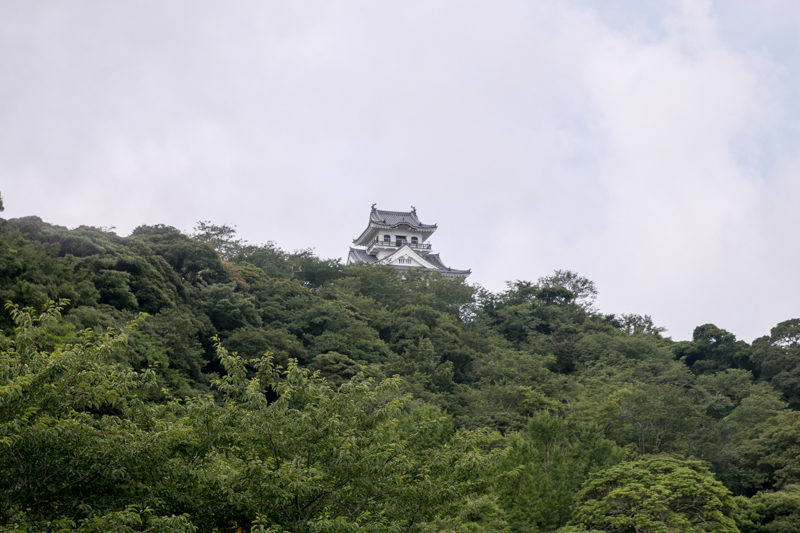 Total size of the castle could be 500 meter long square, and it was suitable as a lord had Awa province. 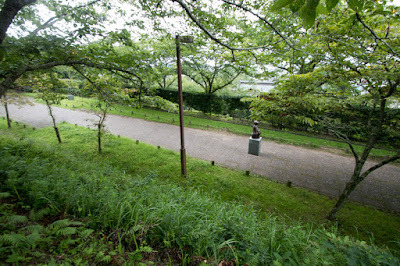 After the death of Hideyoshi, the conflict for next ruler occurred between Ieyasu Tokugawa, the largest lord under Toyotomi government and Mitsunari Ishida (1560-1600), the chief magistrate of government. 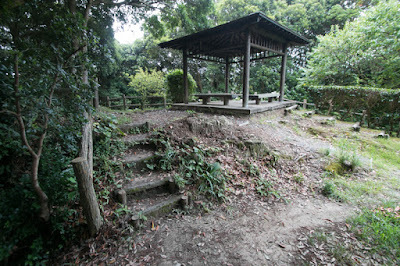 Being located next to Ieyasu and there was not reason to support Mitsunari, thus Satomi clan belonged to Tokugawa side. 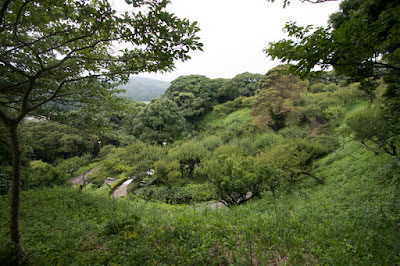 At last Ieyasu Tokugawa broke Mitsunari Ishida at the battle of Sekigahara and became the ruler. 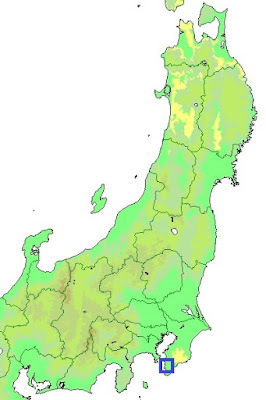 Satomi clan could receive additional territory as a reward. Furthermore, Tadayoshi Satomi (1594-1622), son of Tadayoshi, married with granddaughter of Tadachika Okubo (1553-1628), one of the most influential retainer of Ieyasu. It seemed Satomi clan could continue under Edo Shogunate. 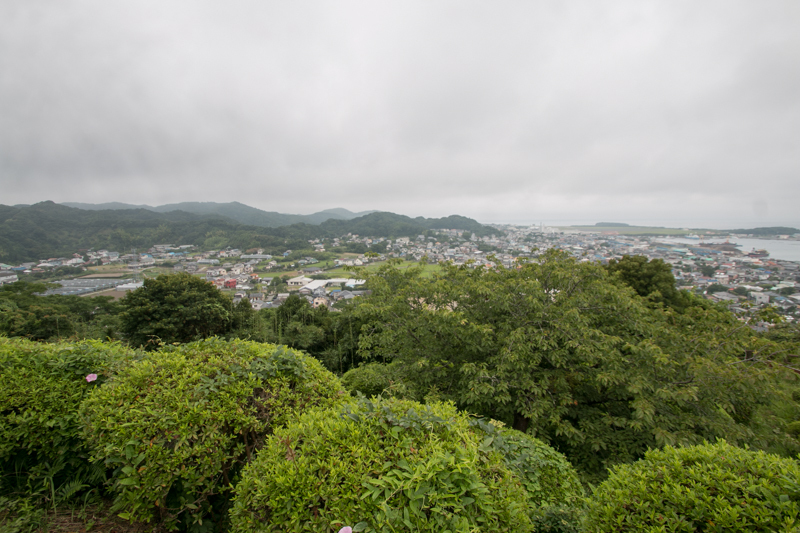 But in 1614, Satomi clan was suddenly confiscated Awa province, and Tadayoshi was expelled to Kurayoshi city (Tottori prefecture). 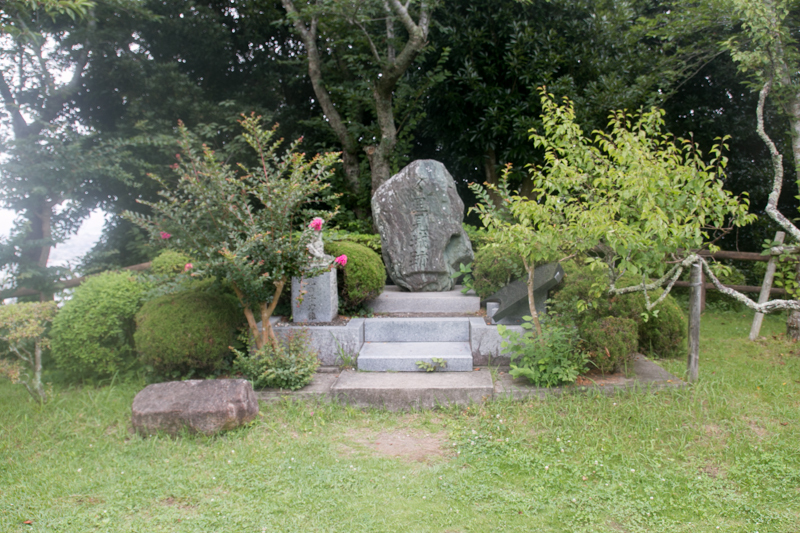 Tadayoshi was confined and died in despair without son, and history of Satomi clan as a lord completely ended. 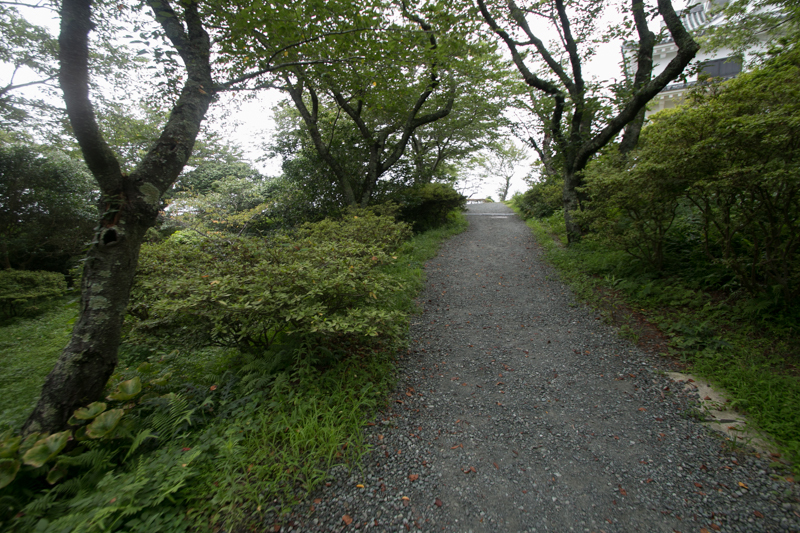 Eight retainer followed his unfortunate master, and it might be a model of eight braves. Along with their master, Tateyama castle was solely broken and also disappeared. In previous year, Tadachika Okubo himself fell from power. 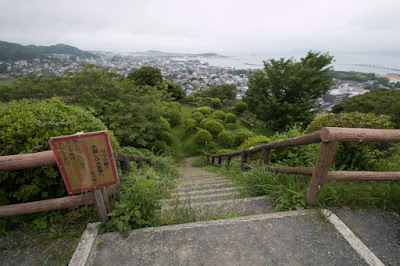 The reason is unclear but it is said that Tadachika was defeated at political conflict by Masanobu Honda (1538-1616), an intelligent staff of Ieyasu, or was involved in the scandal of Nagayasu Okubo (1545-1613), general administrator of gold mine of Edo Shogunate and was close to Tadachika. Satomi clan itself had no relationship with such matters and this was completely a collateral. But Tateyama area is within a throw of stone by ship from Edo city, the capital of Edo Shogunate, and places at the exit of Tokyo bay. 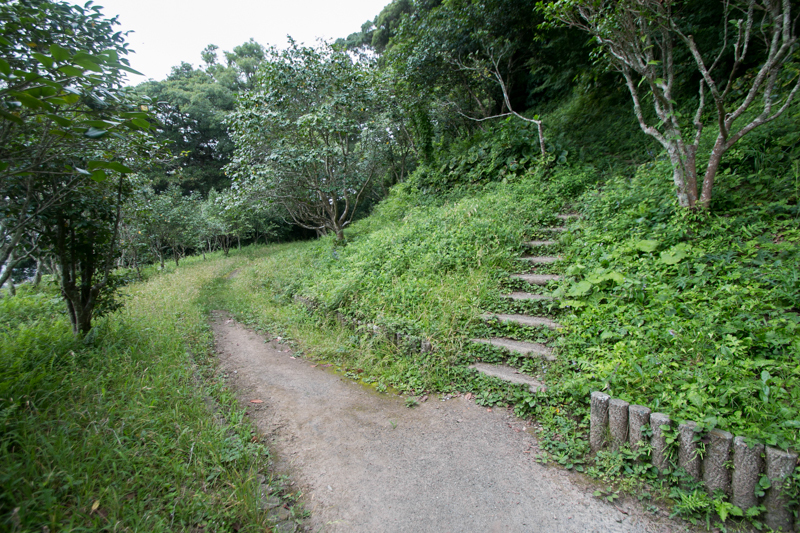 Once Satomi clan betrays, they could make pressure to marine transportation which brought goods to Edo city. 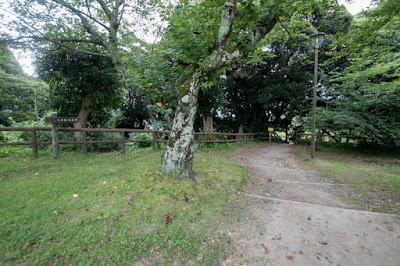 Unfortunately in the past Satomi clan frequently assaulted coast area of Tokyo bay at the battle against Hojo clan, and many former Hojo retainers served Ieyasu as administrative staffs. Over 150 years that Tateyama domain was established by Inaba clan but it was a small domain and built administrative office at the south of former Tateyama castle. 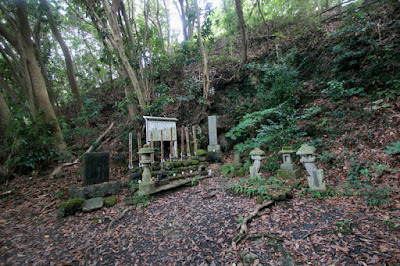 It seemed Satomi clan might disappear from the memory of the people. 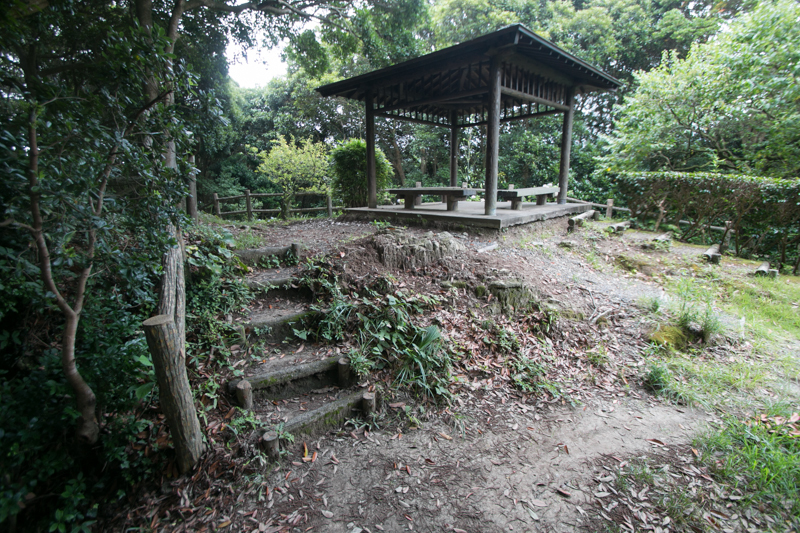 But just 200 years after, a long piece fantasy novel treated Satomi clan named "Nanso Satomi Hakkenden" written by Kyokutei Bakin (1767-1848) started publication. 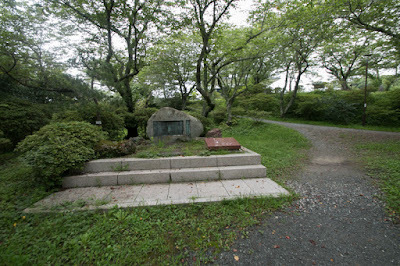 Bakin used 28 years to write whole novel of 106 books, and competed it in 1842. In this story, princess of Satomi clan named Fusehime died by a curse of a witch named "Tamaazusa" formerly ruined by Satomi clan. 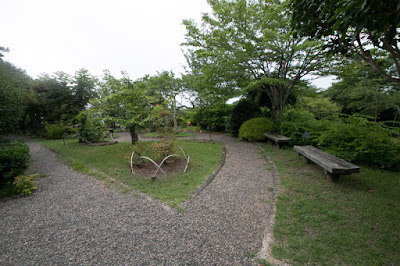 At the end, Fusehime spreads eight balls expresses "kindness", "goodness", "courtesy", "intelligence", "loyalty", "trust", "dutiful" and "respectful". 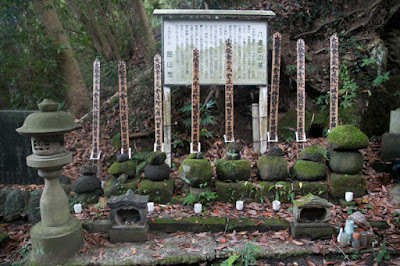 Each ball fell into the hands of eight braves born at different area, and among many difficulty they gradually made fateful encounter and united. 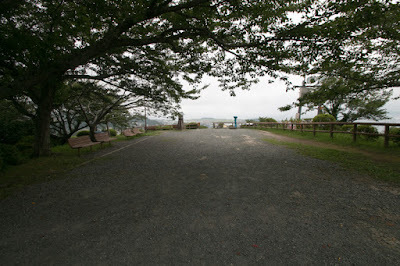 Finally they gathered at Satomi clan, and helped the clan to beat strong enemy and brought peace to Boso peninsula. 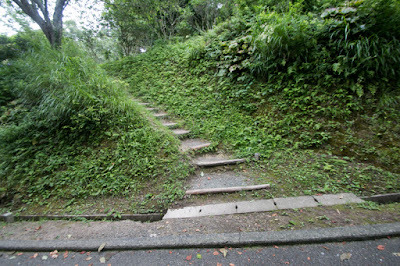 It is said that Kyokutei wrote this story affected by Chinese fantasy "Shui Hu Zhuan", and it also resembles the structure of King Arthur tale. 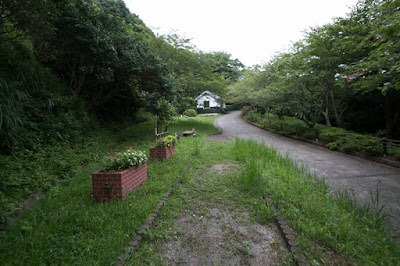 Kyokutei himself had no relationship with Satomi clan and Boso peninsula and it is unknown why Satomi clan is chosen, but unreasonable sudden end of Satomi clan might evoke sympathy and idea of fateful story. In addition to this, the balance of Boso peninsula which is familiar but a bit far from Edo city, with exotic mood of mountains and oceans, might be appropriate to story. Furthermore, from realistic view there were many feudal lords ruined in Kanto region such as Hojo clan or Takeda clan, but these clans were too famous and their images were fixed, and many descendants still remains then might interfere using Shogunate. 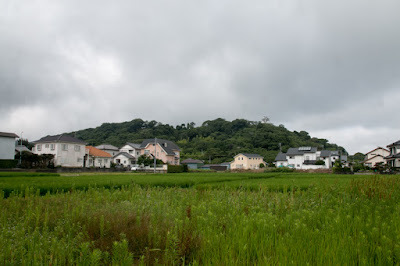 Satomi clan was moderately famous and there was quite a few concerned parson who blame, and it might be suitable to use as a motive of fantastic story. 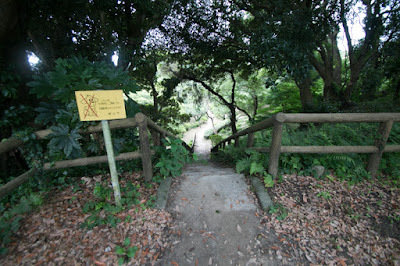 "Nanso Satomi Hakkenden" was a popular first fantastic novels, and still affects pop cultures such as novels and games. Satomi clan physically disappeared in the history but could survive in the world of fantasy. Now building remains and major part of structure is lost, and ground of the castle is used for a tower like museum shows the world of "Nanso Satomi Hakkenden". At the top of mountain, both of tragic end of actual Satomi clan and happy end in fantastic novels easily come to mind, with beautiful scenery of Tokyo bay. 25 minutes walk from JR East Uchibosen line Tateyama station. 25 minutes drive from Futtsu-Tateyama expressway Tomiura interchange.